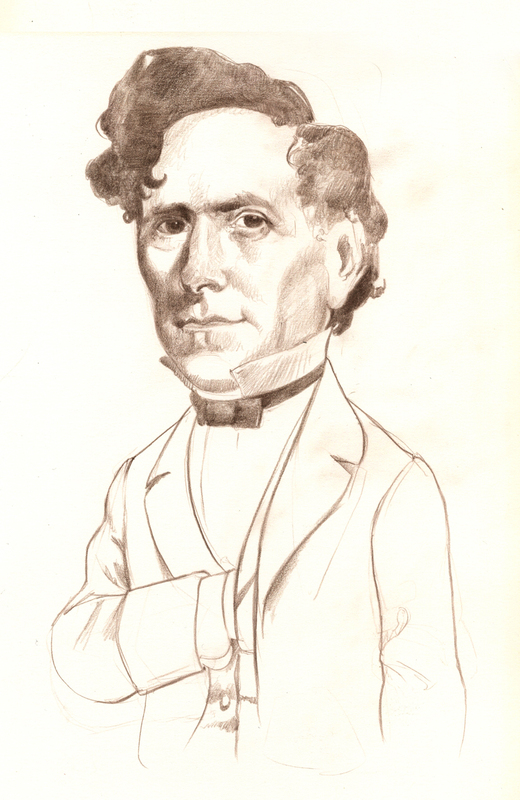 Here’s a sketch of Franklin Pierce was the 14th President of these United States. He is considered by many to be the least effective President. He also looks very similar to Mitt Romney, but there the similarities end. Pierce was a Democrat and Romney is of course Republican. Pierce was rash, and Mitt Romney is the opposite of rash. He’s kind of like the Honda Accord of candidates. He was left with a mess created by a divided congress, some of whom wanted to curtail going state power. He lost one son to fever and the other was decapitated in front of him in a train accident. After this, his wife fell into deep depression from which she never recovered. Franklin Pierce was by most accounts a personable, fun-loving man; however, the tragedies of his life and difficult presidency pushed him into seclusion and alcoholism for the rest of his life. I declare, “Let’s Give Franklin Pierce A Break Day”.